Salt is fundamental to our physical existence, to the rituals and language of ancient origin, and to every civilization. The tears that flow so freely when we are impoverished by loss, share equal salinity with the world's oceans, as does our blood. At times, salt has shared equal value with gold. 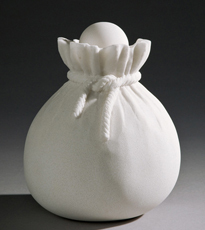 Herein lies a conundrum; a series of original artworks by a master sculptor who set aside the marble he was carving on a visit to a mountaintop workshop he was leading to create a purse for a treasure - the ashes of a loved life, harbored in the ashes of tears. 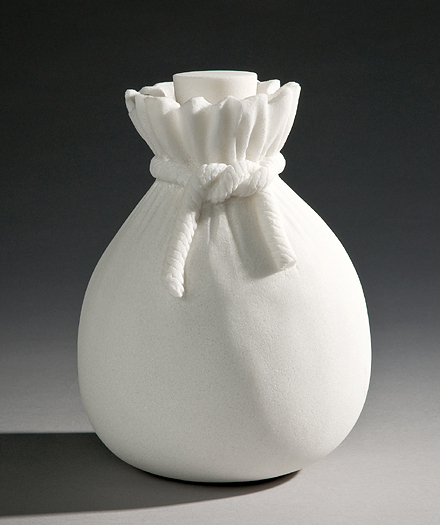 Ante Marinović's carved salt urns are available in FUNERIA's Art Honors Life Gallery and by commission. Please inquire about these original artworks as well as other extraordinary carved salt memorial objects that are being created exclusively for FUNERIA and our most selective clients by a "Maestro de la pietra" who enjoys a highly respected, international reputation for large scale, monumental sculpture, for his leadership in advancing public sculpture as part of our cultural dialogue, as well as for producing superbly crafted and more intimately scaled work. 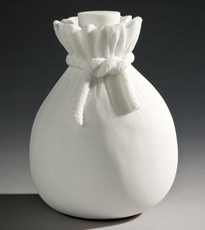 As they are salt, these unique urns are stable in some environments and entirely biodegradable in others. They may also be commissioned in gold, silver, bronze and marble and can be further personalized in innumerable ways.